The seeds of Proteas and many other wild flowers from South Africa are dormant and require very specific conditions for germination. The primer solution made from this paper disc contains a combination of natural substances that have been found to overcome dormancy and stimulate seed germination. The degree of response varies with the species, but on average, treated seed samples give at least double the number of seedlings when compared to untreated samples. Particularly recommended for treating seeds of South African Protea, Leucospermum (pincushions), Leucadendron (conebushes), Erica (heaths), Helichrysum (everlastings), Restios(Cape reeds), Lobelia, grasses, sedges, mesembs (vygies), Gelzenowia, Hibbertia, Stirlingia, Verticordia, Actinostrobus, Pimelea, Lechenaultia, Anigozanthus and many other species. Pack of 1 disc: Treats up to 100 large seeds. For best results keep unused Seed Primer paper discs in a sealed packet and store in a refrigerator at 4°C (40°F) until used. They will last for up to two years. Place the disc in a container (eg a cup). Add 50ml of water to the container to wash the primer from the paper. 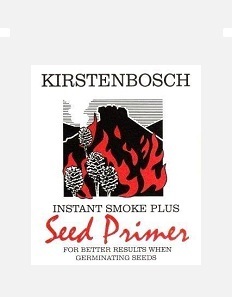 Soak the seeds for 8-24 hours in the primer solution. Remove the seeds and sow in seed trays or pots. Each 50ml solution is enough to treat approximately 100 large seeds.